[It] will provide the setting for Europe’s most exciting, inspiring and enjoyable conference about social media, blogs and digital society […] [with] an agenda reflecting the freshest minds, stories, and subjects from all over the world. […] After five prosperous years, re:publica will reinvent itself once more. As the the organisation committee has already dropped some details, the upcoming event will be probably more exciting than ever! – rE:Unite The European Public on the Net – Closing keynote by Neelie Kroes – European Commission, Digital Agenda. Some regular tickets are still available starting at EUR 130 for a three-day pass. Additionally the exclusive business tickets including lounge access, delicious slow food, and high speed registration (i.e. joining #rp12 straight ahead) are offered for EUR 500 fee each. 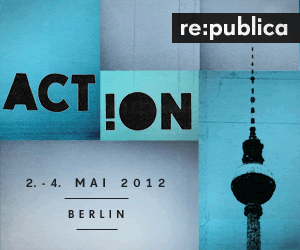 – Click here to register for re:publica 12. Follow Munich Web Week on Twitter and fan on Facebook!